How do you learn from those with whom you can’t communicate? This question has posed a methodological and ethical quandary as I work on community-based mangrove restoration with Marine Conservation Philippines. My research explores local perceptions of mangrove conservation and hopes to help MCP maintain community engagement by assessing the social impacts of its project. But limited proficiency in the Bisaya language means I only understand about half of conversations. This bars me from the perspectives of people who speak no English and feel uncomfortable with foreigners- usually the unemployed and landless, those without formal education or financial resources. As a result, my research risks a sampling bias and my work risks marginalizing the disadvantaged. Participant observation, the method of accompanying people in their daily lives, doing what they do, asking questions and keeping detailed field notes as data, offers some solutions. This summer, participant observation with gleaners has helped me address gaps in my research and better understand how some perceive mangrove forests. 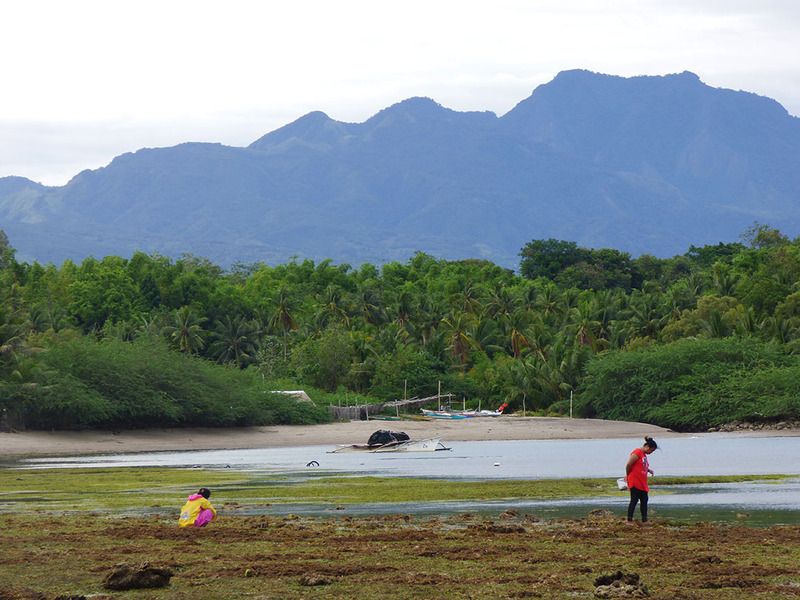 Two women glean for shells on the seagrass beds in front of their houses in Lutoban, Negros Oriental. Gleaning, panginhas in Bisaya, is coastal food foraging. Filipinos glean as a safety net when household economies fall short. As one gleaner smilingly described, “this is dinner when there’s nothing at home.” Joining gleaners and studying their habits has helped me learn from the poor, landless, and unschooled, those same community members absent from meetings and interviews. At low tide, these gleaners traverse the coastline, bent at the waist, combing the tidepools of exposed seagrass beds for shells. They carry buckets filled with snails, clams, urchins, sea cucumbers, and the occasional octopus. Their hunched work is physically taxing, and finding specific invertebrates in the vast stretch of coast requires an incredible store of ecological knowledge. Julio sifts his hands through the mangrove mud in Tambobo Bay, searching for “litob,” or cockle shells, amidst the pneumatophore roots of the “pagatpat” mangrove (S. alba). If tidepool gleaning is highschool, mangroves are college. Mangrove gleaners are species specialists accustomed to ‘blind’ foraging. Here, gleaners must find their dinner under the soil rather than above it, and muddy substrates turn the water impenetrably brown. Some slog knee-deep in mud, sifting their hands through the muck until they feel a clamshell. Others dig shells from the firmer soil near Rhizophora roots. Still others, specializing in giant mud crabs, search near “lapis-lapis” trees (C. decandra), quickly thrusting their hands down burrows to pre-empt angry claws. These strategies require species-specific knowledge encompassing invertebrates, trees, and the wider habitat. This knowledge is both intellectual and visceral. To be a mangrove gleaner is to know roots and shells by their sharp stabs on your bare feet; to be attentive to oceanography and biology on a daily basis; to understand the ecosystem and its interspecies relationships as a lived experience; and to know the importance of mangroves not in abstract or protectionist terms, but as active members of the ecosystem, dependent on and consciously participating in its lifecycles. 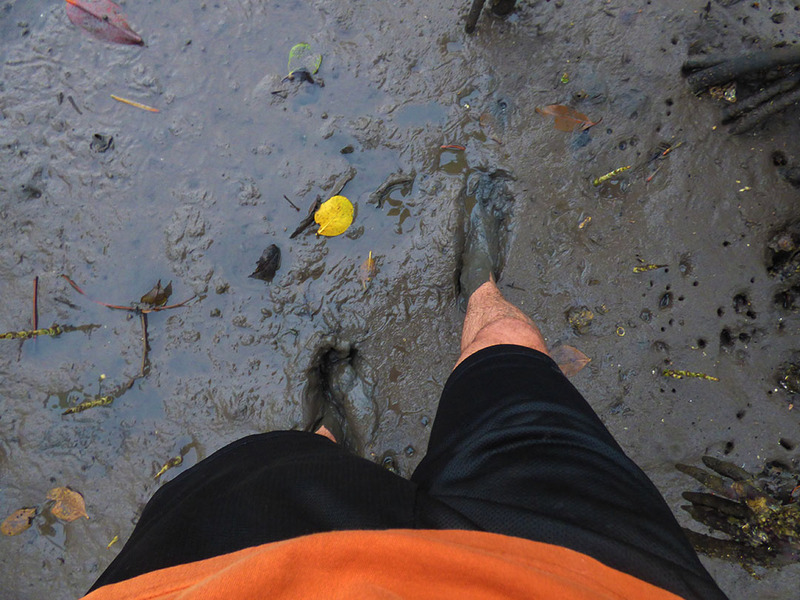 This ankle-deep mud is the shallowest that mangrove gleaning offers. Shin-deep or more is where the real treasure is, whether you’re looking for shells or for knowledge. Gleaning allows me to absorb just some of this knowledge. Gleaners have taught me how to find a variety of invertebrate species. Women with bolo knives indicate which trees create good homes for snails and oysters, and which are better for crabs. Old men harvesting bark from the tungog tree (C. tagal) demonstrate their own reforestation strategies. And shrimpers, chest-deep in water, explain how pregnant prawns hide in mangrove roots, noting that shrimp catch has risen with the health of the forest. Together, gleaners describe a coastal nature that is abundant rather than degraded, in need of maintenance but not enclosure, and important for both its beauty and its bounty. These perspectives are invaluable data to be woven into my assessment of social impacts, but gleaning has not given me direct or complete answers. I’ve had to sift through people’s lived experiences, feel out the muck of language barriers, and wade knee-deep in the mud of cultural differences. I’ve had to glean what I can from the experiences of mangrove foragers and take in the abundance of their insights.